I’m sure many of you remember the story of John Walker Lindh, a young American citizen who converted to Islam as a teenager and eventually went to Afghanistan to fight with the Taliban. Lindh was captured by the US military in November 2001 and was eventually brought back to the US to stand trial. It was the Justice Department’s first high-profile case in the post-9/11 war on terror. While many are familiar with the story of the so-called “American Taliban,” I’m sure far fewer know the story of a woman named Jesselyn Radack, who was a legal advisor to the Justice Department at the time. Shortly after Lindh was arrested, Radack received a call from an FBI attorney, who asked her about the ethics of interrogating Lindh without a lawyer present, specifically mentioning that Lindh’s father had retained counsel for his son. Radack told the FBI that under no circumstances could Lindh be interviewed without his lawyer present. In spite of her clear response – and numerous follow-up emails to that effect – John Walker Lindh was subsequently interrogated without counsel. Attorney General John Ashcroft then held a press conference where he stated, bald-faced, “The subject here is entitled to choose his own lawyer and to our knowledge has not chosen a lawyer at this time.” It was clear to Jesselyn Raddack that Ashcroft and the Justice Department had lied to the American public about its legal handling of John Walker Lindh. Around this time, Radack discovered the emails she had written to the FBI – emails that explicitly spelled out Lindh’s rights – had disappeared from the Justice Department office files. When she realized what was going on, she resigned her post. To her mind, something very, very wrong was going on and she refused to be party to it. When Lindh’s initial hearing began, it became clear to Radack that none of her emails had been presented to the judge on the case – communications that were clearly germane to Lindh’s defense. Now Radack was now faced with an even more powerful ethical decision. She could do nothing, which would in effect continue the cover-up, or she could blow the whistle on the Justice Department. So in June of 2002, three weeks before Lindh’s hearing was to take place, Jesselyn Radack downloaded the emails from her personal files and sent them to Newsweek magazine. Her revelation of the Justice Department’s malfeasance had a powerful impact on the government’s case. Although he originally faced three life sentences, Lindh eventually plea-bargained to 20 years in prison without possibility of parole. For her part, Radack’s whistleblowing came at a huge price, as she knew it would. The Justice Department subsequently brought a criminal case against her, although she was never told for what she was being investigated or for what she might be charged. She also lost her new job at a private law firm after her former government employers put pressure on her partners. The Justice Department then referred her for discipline to her bar associations, effectively rendering her unemployable. As a final insult, she was placed on the national “no-fly” list. The criminal case against Radack was later dropped without explanation and she was eventually removed from the no-fly list, but the damage to her career and her livelihood was permanent. Her experience obviously cost her any future in government, but in the end it led her to a different calling. Radack now devotes her life to defending whistleblowers at the Government Accountability Project. I first learned about Jesselyn Radack’s story when I read an article she wrote about it in, of all places, Reform Judaism magazine. In the article Radack, who is an active member of the Jewish community, wrote openly and passionately about the Jewish values that lay behind her actions. She quoted her adult Bat Mitzvah Torah portion: “Lo ti’eh aharay rabim” – “Thou shalt not follow a multitude to do wrong” (Exodus 22:3) – a dictum she says has motivated her ethical decision-making ever since. People also ask me if this experience has engendered a crisis of faith. On the contrary, Judaism has helped me get through this difficult period. My (rabbis have) been sympathetic and supportive. I have also drawn strength from the writings of Rabbi Harold Kushner, who taught me that God did not cause my suffering and could not prevent it. Rabbi Kushner’s re-interpretation of the story of Adam and Eve teaches that the ability to choose between right and wrong is what makes us human. God does not interfere with that choice. But God can give us the strength of character we need to handle the consequences. I chose my conscience over my career and take pride in having spoken truth to power. I remember reading that article back in 2006 – and in particular I remember being deeply affected by the religious and moral convictions that motivated her actions. On a personal level, I’d always been a strong advocate of whistleblowers and the value of government transparency. But I don’t think I had ever truly thought about the act of whistleblowing in the context of Jewish values until I read Jesselyn Radack’s words in Reform Judaism magazine that day. Since that time, I’ve thought a great deal about this issue. And so this morning I’d like to take some time to discuss the subject of whistleblowing – a subject that has been in the media spotlight a great deal this past year. I’d like to explore the issues raised by the more well-known whistleblowers such as Chelsea (formerly Bradley) Manning and Edward Snowden – and others who are not as well known but whose actions are just as worthy of our attention. Most of all, I want to share with you why I believe whistleblowing is not only a critically important American value, but a deeply sacred Jewish value as well – one that challenges us particularly as we gather now for the New Year. And liberty cannot be preserved without a general knowledge among the people who have a right from the frame of their nature to knowledge … But besides this they have a right, an indisputable, unalienable, indefeasible divine right to the most dreaded and envied kind of knowledge, I mean of the characters and conduct of their rulers. True whistleblowing is not a traitorous act, though I think many governments would love their citizens to believe so. Whistleblowers are not employed by enemy nations – by definition they act individually and out of their own conscience. And while they do break laws, they do so not for personal gain but for the greater good. They do so to assert that no one – not even the most powerful of governments – are above the law. In their defense, governments will invariably claim that secrecy is essential to “national security.” On the face of it, it’s difficult defense to for us to refute. After all, every nation’s primary duty is to ensure the safety and security of its citizens – it would be naive and in fact dangerous to try to claim otherwise. But it would be equally naive to assume that when our government acts in secrecy, it must somehow be doing so for reasons of legitimate national security. History has taught us repeatedly that governments will invariably use secrecy to cover up their own illegitimate actions – actions that will often end up betraying the very well-being and security of their own citizens. Possibly the most famous whistleblower in American history, Daniel Ellsberg, has written extensively and eloquently on this subject and about the process he went through that ultimately led to his revelation of the Pentagon Papers in 1971. Ellsberg was a former marine who joined the Pentagon in 1964 and later worked for the RAND Corporation. Like almost all whistleblowers, he was originally among the “true faithful” – a patriotic American who believed that the US could and should be a force for good in the world. But as his government career progressed, he harbored profound inner doubts as he became privy to the highest decision making institutions during the buildup of Vietnam War. Daniel Ellsberg had first hand knowledge that leaders at the highest levels of government knew from early on that the Vietnam war could never be won and yet insisted otherwise to the Congress and the American public. Moreover, they continued to escalate a war they knew was doomed, knowing full well their actions would lead to more American deaths overseas. 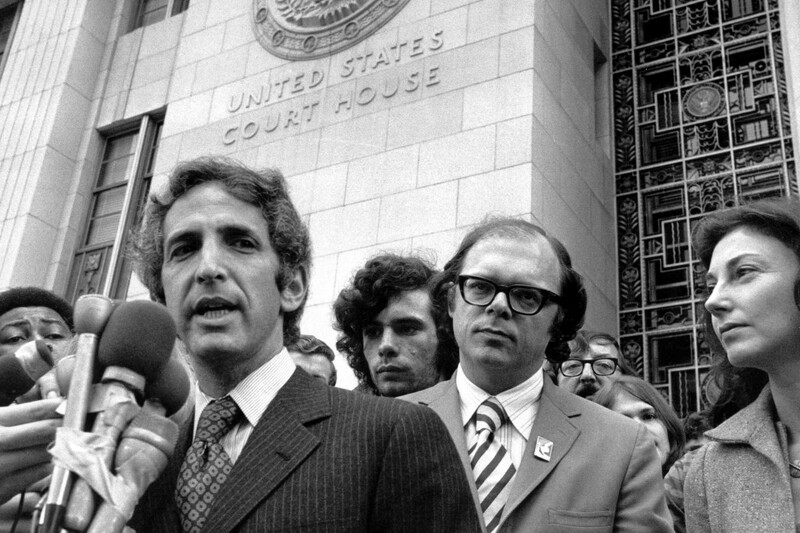 When Ellsberg went public with the Pentagon Papers, he went up against a powerful bureaucracy and government culture of secrecy. As a former insider, he had a first row seat at a massive act of government malfeasance, but he also was constrained by a deep-seated mentality that considered the telling of secrets to be a traitorous act. It’s no coincidence that most whistleblowers begin as patriotic insiders. But ironically enough, it’s the same motivation that initially drives them to serve their country that eventually drives them to bring the truth of their government’s wrongdoing into the light of day. It is, of course, an act that carries with it a huge cost. When whistleblowers decide to go public, they know full well it is an act that will cost them their jobs and their livelihoods. They know they will likely be publicly vilified, their personal lives dissected, their reputations slandered. And of course, they also know they will likely endure prison time, be forced to go underground or live in exile. Whistleblowers are indeed lightning rods – and governments count on this. That’s why, I believe, we invariably focus more attention on the whistleblowers themselves than the actual crimes they reveal. That’s why, for instance, I believe we’re hearing so much bandied about regarding Chelsea Manning’s personal life and emotional struggles. Our leaders and the media would much rather we focus on Manning personally. As long as we do so, we’re given a pass on the disturbing information Manning brought to light – and we don’t have to confront the truths of our nation’s crimes in Iraq, in Guantanamo and around the world. Among Manning’s many revelations through Wikileaks is the now infamous video taken from an Apache helicopter in 2007, in which Americans soldiers shot and killed eleven individuals, including two Reuters reporters, in the streets of New Baghdad. When a van arrived to help the injured, the soldiers fired upon it as well, seriously injuring two children. As you watch the video, you can hear the voices of American soldiers urging each other on, joking about the dead and dying. At one point a soldier laughs when Humvee runs over a dead body lying in the street. I remember watching this video when it was released in 2010. I posted and wrote strongly about it on my blog at the time. It was deeply and profoundly horrifying to see the dark reality of our military actions in Iraq in such a graphic and brazen manner. But I remember well being so grateful that this video had been brought out into the light of day. As it turned out, however, Manning was not the only member of the military who recoiled from this particular action. An American infantryman named Ethan McCord rescued the two children from the shot-up van – and after the video was released, McCord publicly thanked Manning for bringing it to light. By focusing so heavily on Manning’s private life (the article) removes politics from a story that has everything to do with politics. The important public issues wrapped up with PFC Manning’s case include: transparency in government; the Obama Administration’s unprecedented pursuit of whistle-blowers; accountability of government and military in shaping and carrying out foreign policy; war crimes revealed in the WikiLeaks documents… and more. If PFC Manning did what he is accused of, he is a hero of mine, not because he’s perfect or because he’s never struggled with personal or family relationships –most of us do – but because in the midst of it all he had the courage to act on his conscience. Chelsea Manning has paid a profound price for blowing the whistle on the actions of the American military. After her arrest, she was put in a Marine brig in Quantico, Virginia, held in solitary confinement for 23 hours a day for nine months, forced to sleep naked without pillows and sheets and restricted from physical recreation or access to a television or newspaper. Manning’s punishment was later condemned as “excessive” by a military judge and “torture” by the UN. And of course, Manning has now been sentenced and faces an additional 35 years in prison. As for the soldiers responsible for the attack in the video? The US military conducted its own investigation of the incident and eventually cleared everyone involved of wrongdoing. To date, no one has ever been held accountable – for these or for any of the numerous disturbing revelations Manning has brought to light. When a soldier who shared information with the press and public is punished far more harshly than others who tortured prisoners and killed civilians, something is seriously wrong with our justice system. On Rosh Hashanah, the day for asking the hard questions, it’s well worth asking: who has committed the greater crime? The government that breaks the law and covers its actions up under the pretense of national security, or the single individual that breaks the law in order that these crimes might be brought out into the light? It’s well worth asking why? Why is Chelsea Manning facing thirty five years in prison for revealing the disturbing truths about our government’s actions in Iraq while the very leaders who deceived us into that war have yet to be made to account for their actions? And why, for that matter, has Edward Snowden, the man who blew the whistle on the NSA’s surveillance on American citizens, been forced to live in exile in Russia while our Director of National Intelligence can deny the facts Snowden brought to light under oath and still remain in his job? I believe Jewish tradition demands that we ask these kinds of questions. After all, asking hard questions to powerful leaders is a time-honored Jewish value that dates all the way back to the days of the Prophets. The Prophets were, in fact, the whistleblowers of their day. Just like our present day examples, they too spoke truth to power; they too sought to publicly reveal political corruption and hypocrisy of the governments of their time; and they too were hounded and persecuted by the powers that be for their truth-telling. I’ve said and written often that I believe the prophetic stream in Judaism to be the most important – and in many ways the most sacred – of our tradition. As a Jew, I’ve always been enormously proud of the classic rabbinical response to government power. I believe that the Jewish people have been able to survive even under such large and mighty powers because we’ve clung to a singular sacred vision that says there is a Power even greater. Greater than Pharaoh, greater than Babylon, even greater than the mighty Roman empire and the myriad of powerful empires that have come and gone since. As Jews, we know all too well that powerful nations and empires have historically exploited fear in order to increase their control at home and abroad. To be sure, it’s when times are fearful that we need these kinds of truth tellers the most. In today’s post 9/11 world, I think it’s fair to say that levels of our government’s control – and the secrecy it employs to cover it up – go deeper than anything we witnessed even at the height of the Cold War. During his first presidential campaign, Obama promised to rein in Washington’s culture of secrecy that has grown so significantly during our nation’s so-called War on Terror. While we can argue about whether or not he’s been successful in this regard, it cannot be denied that Obama has become he most aggressive president in American history when it comes to whistleblowers. Until this administration, only three government whistleblowers (including Daniel Ellsberg) had ever been charged by the Justice Department under the Espionage Act of 1917. Under Obama, the Justice Department has brought charges against eight individuals – more than all previous American presidents combined. His administration’s actions drive home the reality that this issue is not really about left or right. It is about government – and in particular, large powerful governments such as ours, that will invariably abuse their power and act to cover up their abuses. To quote another great American truth teller, the venerable investigative journalist Izzy Stone, “All governments lie.” Stone didn’t mean this to be a criticism of government itself – on the contrary, he wrote endlessly about the critical role governments must play in creating ordered and just societies. He simply meant that there will always be a gap between what a government does and what it says it is doing. And that as citizens, we simply cannot sit back and assume governments will voluntarily rein in their abuse of power or hold themselves to account. That, quite frankly, is our job. And that is why whistleblowers are so critical and why I believe they are worthy of our gratitude and support. They represent, in a sense, the final defense of an informed citizenry. They are the ones who are willing, at great personal sacrifice, to hold the most powerful people and institutions in the world accountable. I know that all citizens want to trust their governments. We all want to believe our governments have our best interests at heart and will act to keep us safe – particularly in fearful times such as these. But as fearful as we are, we would do we to ask whether increased militarism abroad and the narrowing of our civil liberties here at home will truly bring us security in the end. As for me, I tend to agree with Daniel Ellsberg, who recently wrote: “One of the lessons of the Pentagon Papers and Snowden’s leaks is simple: secrecy corrupts just as power corrupts.” Today, as in years past, we owe a profound debt to those who courageous enough to tear down the shrouds of secrecy, often at enormous personal cost, so that we may all find our way to a future of true security – not a false sense of security in which the powerful hide behind higher and higher walls but a real security based upon leaders and citizens are truly accountable to one another. After all, isn’t that really what our sacred day today is all about? When we sound the Shofar on Rosh Hashanah, we are, in a sense, “blowing the whistle.” The Shofar represents, among other things, an act of revelation. When the shofar is sounded, we bring all the secrets of the past year out of the shadows. We announce our readiness to shine light into the dark places of our souls and all the actions for which we are accountable. We do this because we know, deep down that secrecy corrupts the soul – and that true security, true liberation, can only come from living lives of transparency and openness. Indeed, in the coming year, each of us will inevitably be faced with the challenge to speak out or remain silent. To remain in the darkness, in a place or secrecy and shame, or to shine a light into the dark places that we might all find our way forward together. This New Year, I hope we can all find the means to be truth tellers in our own right, to find the courage to speak where there is only silence. And to wrestle honestly with the questions: what is the world in which we truly seek to live? Where, in the end, will we find true security? And what will we be willing to do about it? Baruch ma’avir afeilah u’meivi orah – Blessed is the one who removes the darkness and brings light. This entry was posted in Fear, High Holidays, Human Rights, Iraq, Judaism, Politics, Religion, Sermons, Terrorism, Torture, UN, War on September 6, 2013 by Rabbi Brant Rosen. Seems mildly ironic to break your sabbatical on Rosh Hashanah, but this is a wonderful piece that we all need to hear. Thank you. A fascinating view. Thank you, so much. The image of the shofar as whistleblowing is powerfully evocative!! Thank you!!!! Although I was Unable to be there for the Holidays i recieved a blow by blow report of your sermon and feel that we need to people to let us know what our Government is doing without any accountability to its citizens.i as always am proud to be a member of a congregation whos Rabbi is not afraid to tell the truth. An excellent sermon. I’m grateful for it, and grateful to my son for sharing it with me. I have made Rosh Hashanah my personal holiday and a very sacred day at that for me. Thank you for sharing this sermon which brought tears to my eyes. Thanks Brant for a great sermon. Please chamge the image you use though. Before being arrested, Chelsea Manning said quite explicitly that her biggest fear was not jail, but rather having a photo of her as a man circulated around the world. Also, saying “Bradley (now Chelsea)” isn’t the best framing in respecting a trans person’s identity. In this case I know Bradley is the name most known, but I would put Chelsea first and say “Chelsea Manning (formerly known as Bradley)” or something like that. I say all this because I’m inspired by your work, and trust that you’re working to be the best ally to trans people that you can as well. Well written post. One of the best I have seen regarding Whistle blowers. I see one flaw which leads to an important conversation on the topic of ethics and the law. Any employee of a government must know the boundaries and limitations of personal faith, conviction under such guidance and the law. Separation of Church and State must be maintained. In my opinion, it is one of the reasons U.S. politics has become so divisive. Manning, and Snowden had options before going to the press, as did you. The Attorney’s General Office, in which none of your examples or you decided to exercise. Another option would have been to submit evidence of wrong doing by other government agencies to White House Counsel. The use of the Pentagon Papers as an example is plagued with various personal objectives, primary of which, Ellsberg opposed the war, let alone his faith or personal ethics. No employee regardless of rank, position or authority including Secretary’s or Directors of various agencies, are responsible or legally allowed to make, change or object to policy. In fact, all the cases in your post have significant elements of personal objection, which have nothing to do with violating U.S. law. Snowden’s is the exception, where it is likely several U.S. laws have been broken (but in principle, allowed under the U.S. Patriot Act). Behavior of government administrations must be kept in check. How that process unfolds is one that will be debated for decades. I am not sure that Whistle Blowers should believe that the first step is to send evidence to the press and nor am I convinced that given their relatively low ranks, experience and capabilities, that they knew what they were doing. Ellsberg was the most experienced of the three who was 38 at the time of the Pentagon Papers, a USMC veteran, one civilian tour in Vietnam, and 3 years in the Secretary of Defense Office before joining RAND. Manning was 22 while Edward Snowden was 29 at the time of his disclosures and relatively speaking, no post secondary education of any kind. Ellsberg had a PhD in Economics and significant exposure to the inner workings at the senior level. Your best example in Whistle blowing is your own case regarding John Walker Lindh. What unfolds is exceptional writing and account of what occurred. As soon as you brought in your own rationale as to how to disclose and proceed, I began to squirm. As a lawyer, you had options. I am not sure you picked the best one or made the right decisions based on your faith instead of the laws of the country. Separation does exist. Nonetheless, I enjoyed reading this post. As one who does not subscribe to a religious faith, this sermon is certainly one that could make me question that condition. Truly a powerful statement that makes me want to be a member of Rabbi Rosen’s congregation. How grateful I am that I can read and learn from his words online. I agree. One need not belong to any religion to experience the blessings of Rabbi Brant’s congregation, only to receive his sermons which are righteous before God whether one believes in God or not. “The Prophets were, in fact, the whistleblowers of their day.” Indeed. And I am grateful for our modern day prophets. Over the years I have supported whistleblowers and others in prison for shining light in dark places, including Israeli nuclear whistleblower Mordechai Vanunu. Thank you – I appreciate reading this sermon during the Days of Awe, and it’s invitation for each of us to consider our own role as truth tellers. If Mordechai Vanunu did what he did in the U.S. in the 1950s or in Russia now he would have been executed. He is not a whistleblower, he is simply a traitor. Well, I don’t know how you define “whistleblower” and “traitor” but of course there are people who consider Ellsberg, Manning, Snowden traitors. Sharing information that you feel the public in a democratic nation has the right to know is an element of what motivates whistleblowers… If Mordechai Vanunu did what he did in Iran now much of the world would view him as a hero. Many, including Daniel Ellsberg, consider him to be a hero for blowing the whistle on Israel’s nuclear arsenal. I do not believe that it is okay (or consistent and fair U.S. foreign policy) for some nations to have “secret” or “hidden” weapons of mass destruction but not okay for others. Thanks for this lesson. You’re on the true path.